The Greenland wolf has been described as a white to pale colored wolf very similar to the Arctic wolf and resides in Greenland. It was classified as a distinct subspecies in 1935 by British zoologist Reginald Innes Pocock. 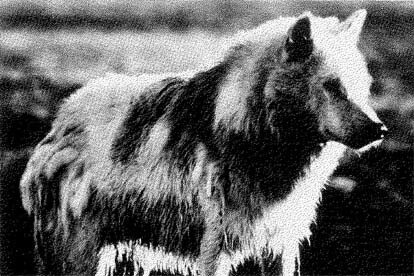 With that said, there is no available evidence to suggest that the Greenland wolf still exists or ever did. In fact, the validity of the subspecies Canis lupus orion is doubted by many scientists. It seems unlikely that the Greenland wolf has at any time developed subspecies characteristics distinct from its Canadian counterpart. The lighter weight of these wolves in Greenland is very likely due to malnutrition rather than a morphological difference between the Canis lupus orion and high Arctic tundra wolves. It is generally acknowledged that the Greenland wolves are migrants from Canada (Vibe, 1967), and the documented reports of wolves on the sea ice in both the northern and southern parts of Nares Strait suggest that this migration is frequent and still persists (Dawes, 1978). If the Greenland wolf is an actual subspecies, it is most likely extinct.